Thank you kindly to Comic Book Resources, The Beat, The Cool Kids Table, Vito Delsante, Dustin Harbin, Curt Purcell, and all the other illustrious personages who linked to Destructor today. And a heartfelt welcome to everyone who followed those links and braved the roving marauders of the information superhighway who beleaguered the site earlier. We hope that what you find here will be rewarding in some way. We at DestructorComics.com apologize for the service outage this morning, particularly to readers of Comic Book Resources and to our friends in the press. We thank you for your patience and are working diligently to restore the system. 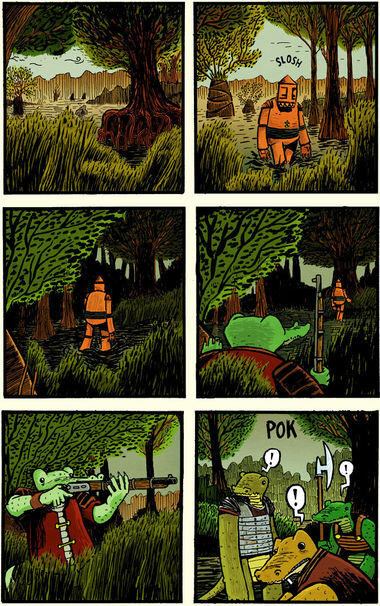 In the interim, click the following link to read the first page of our inaugural story, Destructor Comes to Croc-Town. This is the oldest image of Destructor currently known to exist. 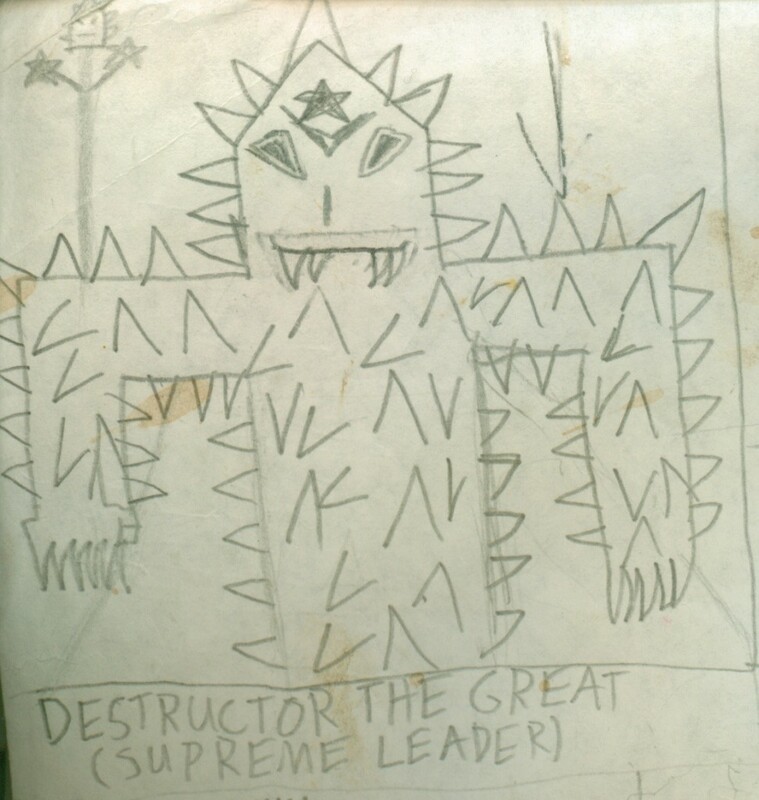 It was drawn c. 1986-1987 to replace an earlier drawing of Destructor — the first — that was accidentally abandoned somewhere in Manhattan. Note the spikes on the armor, signaling that this portrait was taken well into Destructor’s reign. My name is Sean T. Collins, and for the past 24 years it has been my task to record the life and times of Destructor the Great. My partner Matt Wiegle and I are looking forward to sharing this record with you. While our story truly begins years ago and years away, our telling of it begins with “Destructor Comes to Croc-Town,” chronicling an event from Destructor’s travels during the First Interregnum. Though it was previously published in black and white, it is now our pleasure to bring you “Croc-Town” in color. We believe it is the first such glimpse into Destructor’s world so available. Endless thanks to Mr. Wiegle for his diligent work in creating this site and the comics it houses.